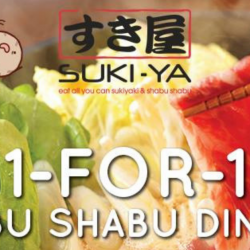 Till 14 Apr 2019 Suki-Ya: Enjoy 1-for-1 Shabu Shabu at Tampines Mall! 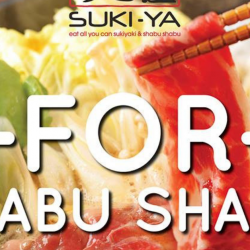 1-FOR-1 SHABU SHABU IS BACK at Suki-Ya! This time it is happening exclusively at their Tampines Mall out from 8 - 14 April 2019, 11.30am - 4pm. 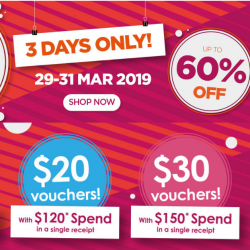 29 - 31 Mar 2019 Guardian: Super Sale with Up to 60% OFF, Up to $50 Voucher & More than 800 Deals! The long-awaited Guardian Super Sale is back! For 3 DAYS only, enjoy up to 60% off, up to $50 voucher and more than 800 deals! Hurry, grab your favourites at your nearest Guardian stores or online from now till 31 March. 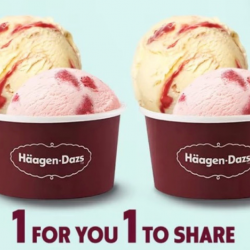 Till 28 Mar 2019 Häagen-Dazs: Enjoy 1-for-1 Double Scoop Ice Cream at All Häagen-Dazs Shops! What better way to celebrate Spring in style, then by bringing back Häagen-Dazs' FREE double Scoops promotion? From now until 28 March, buy a Double Scoop and get a Double Scoop FREE! Come double your happiness @S$10.9! T&Cs apply. Till 31 Mar 2019 Burger King: Buy 1 Get 1 FREE Double Mentaiko BK Chick’N Crisp & $2 Crispy Chicken Cutlet! Two is better than one. 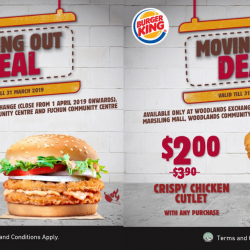 As Burger King's Woodlands Exchange outlet will be closed starting from 31st March '19, they are bringing you two great deals! Buy 1 get 1 free Mentaiko BK Chick'N Crisp ($6) and get a Crispy Chicken Cutlet for only $2 (UP $3.90) at Burger King Woodlands Exchange, Fu Chun CC, Woodlands CC & Marsiling Mall. So come on over to enjoy this limited time offer! T&Cs apply. 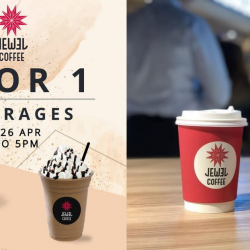 Till 31 Mar 2019 Toast Box: Flash Image to Enjoy Buy 1 Get 1 FREE Ice Kopi/Teh Melaka! Share your love for gula melaka with a buddy! 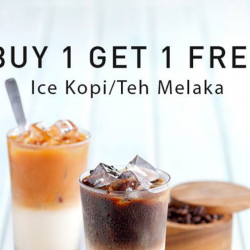 Flash below FB post/image at Toast Box to enjoy a BUY 1 GET 1 FREE Ice Kopi/Teh Melaka! Valid at all Toast Box outlets till 31 March 2019. 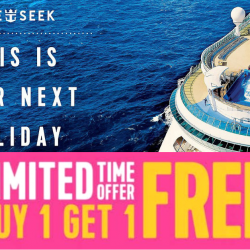 Till 20 Mar 2019 Royal Caribbean International: Buy 1 Get 1 FREE Cruise at Raffles City Roadshow! Revel in the majestic grandeur of a Royal Caribbean vessel, taking you to your dream holiday destination! Book your cruise at their latest Raffles City roadshow and enjoy Buy 1 Get 1 FREE cruise offer! 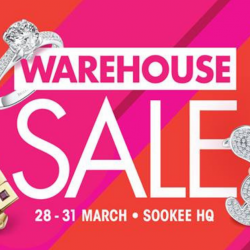 Sale ends 20 Mar 2019. 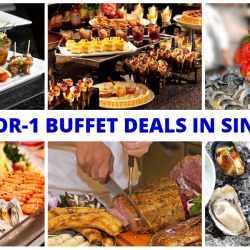 Your Ultimate Guide to the Best 1-for-1 Buffet Deals in Singapore! The best way to reward yourself after a day of hard work is to grab a friend and have a good meal! But you are unwilling to spend too much on one meal? This ultimate guide is just for you! Grab a friend and head down to these restaurants to enjoy a 1-for-1 buffet promotion from now till 31 March 2019! Just half price for you and your friend to enjoy all-you-can-eat buffet with fresh seafood, local and international delicacies and delicious desserts. Remember to share these good deals with your family and friends! 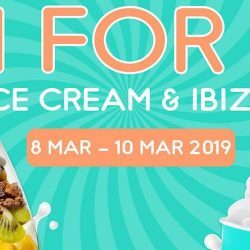 Yolé: Enjoy 1-for-1 Ice Cream & Ibiza at Westgate Outlet! Yolé's Westgate outlet has expanded their seating area so let's chill out and eat! Enjoy a 1-for-1 deal on all their fresh ice cream, frozen yogurt, and Ibizas from the 8th to the 10th of March at their Westgate outlet! 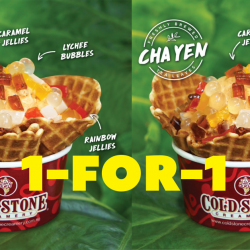 Cold Stone Creamery: Enjoy 1-for-1 Thai Milk Tea Ice Cream at Orchard Central Outlet Before It Closes! Say goodbye to Cold Stone Orchard Central outlet with 1-FOR-1 THAI MILK TEA on Love It and Gotta Have It sizes! Available exclusively at Orchard Central outlet from 1 March - 7 April 2019. Last scoop will be served on 7 April 2019. SK Jewellery: Anniversary Sale with 1-for-1 Snoopy Collection Accessory & More! 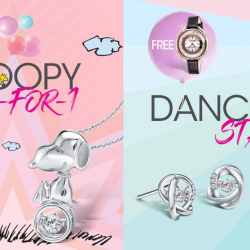 SK Jewellery celebrates its anniversary with an exciting 1-for-1 Snoopy collection deal! Buy 1 Snoopy accessory to receive another FREE Snoopy accessory. Available till 30 Apr 2019. Terms & conditions apply. 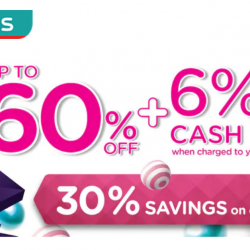 Watsons: 1-Day Member Sale with 30% Savings on More than 100 Brands, Buy 1 Get 1 FREE Deals & 6% Cash Rebate with POSB Everyday Card! The ALL NEW Watsons Members’ Sale is here! 24-HOURS ONLY, get 30% savings on more than 100 brands, buy 1 get 1 free deals, up to $50 cash vouchers and 6% cash rebate with POSB Everyday Card! Exclusively for Watsons members and DBS/POSB credit or debit cardmembers on 6 March 2019 at 66 participating stores and Watsons Online. 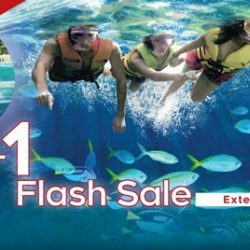 Adventure Cove Waterpark: 1-for-1 Flash Sale – Two Adult One-Day Tickets at only SGD38! It’s now or never! Grab a friend and snorkel into a world of fun with friendly fish and thrilling slides at the award-winning Adventure Cove Waterpark, all at just $38! 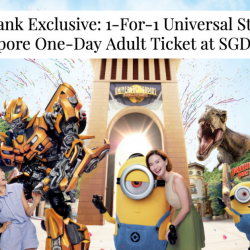 Final chance to grab 1-for-1 Adventure Cove Waterpark Adult Dated One-Day Ticket on 6 March 2019! Suki-Ya: Enjoy 1-for-1 Shabu Shabu at Plaza Singapura! Yolé: Flash Image to Enjoy 1-for-1 Milkshake at The Clementi Mall! 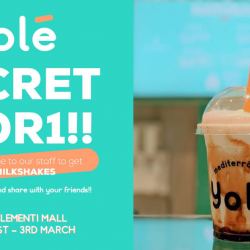 Yolé is finally launching their milkshakes at The Clementi Mall! What better way to start it off with a bang than with a secret 1-for-1 promo! This includes the Limited Edition Brown Sugar Milkshake! It's happening only at The Clementi Mall from the 1st to the 3rd of March, so mark your calendars and remember the dates! 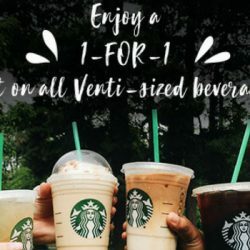 Starbucks: Enjoy 1-for-1 Venti-sized Handcrafted Beverage from 3pm to 7pm! Yay, treats for two at Starbucks! From 25 - 28 Feb, 3-7pm, grab any Venti handcrafted beverage and enjoy another FREE. T&Cs apply. 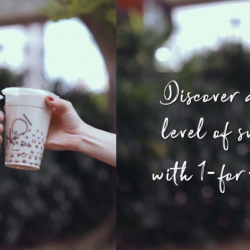 12 - 16 Feb 2019 KOI: Get 1-for-1 on Signature Drinks with OCBC Pay Anyone™! Looking for a lovely way to sweeten things up this Valentine’s? Get 1 for 1 on KOI’s signature drinks and share it with your loved ones when you pay with OCBC Pay Anyone™. Valid from 12 to 16 Feb 2019. T&Cs apply. 14 Feb 2019 Ben & Jerry’s: Get 1-for-1 Scoop of Ice-cream on Valentine’s Day! Treat your sweetheart in the sweetest and nicest way we know how! 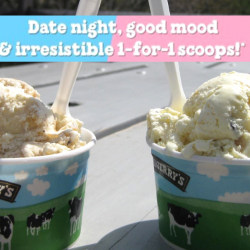 Head on down to any Ben & Jerry's Scoop Shops on 14 February 2019 to enjoy a moo-tastic date night, good mood and irresistible 1-for-1 scoops! Till 30 Dec 2019 Triple Three Restaurant: Enjoy 1-for-1 Lunch Buffet & 50% OFF 2nd Diner for Dinner Buffet with DBS/POSB Cards! 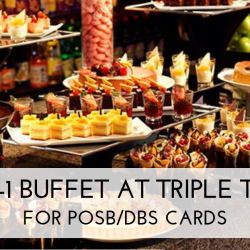 Enjoy 1-for-1 lunch buffet & 50% off 2nd diner for dinner buffet at Triple Three Restaurant @Mandarin Orchard Hotel with your POSB/DBS card! Valid till 30 Dec 2019. 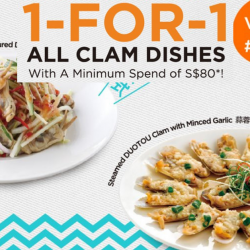 You can also enjoy the same offer when you pre-purchase vouchers at Chope! 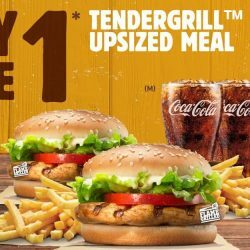 From 11 Feb 2019 Burger King: Enjoy 1-For-1 Tendergrill Chicken Upsized Meal This Valentine’s Day! [BUY 1 FREE 1 VALENTINE'S PROMO] Love me tender, love me grilled! Share the love this Valentine's Day with 1-for-1 Tendergrill™ Upsized Meals with your best mates at Burger King! Promo valid from 11 February 2019 onwards, while stocks last. Terms & conditions apply. Remember to order over counter instead of self service kiosk to redeem! 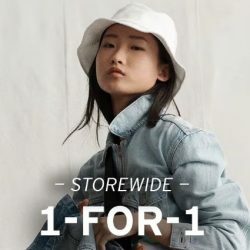 Till 4 Feb 2019 Levi’s: Buy 1 Get 1 FREE Storewide on Regular-Priced Apparel! Buy 1 Get 1 Free Storewide at all Levi's stores! Find your favourite denim essentials this season only at Levi's®! For a limited time only. Terms apply. Selected styles excluded. Shop at a Levi's® store near you now!